Elite colleges often use GRE to admit students to their programs. The problems with the GRE is that the testing is geared around a certain demographic and may skew the results from minority candidates. Some colleges are debating getting rid of the GRE as a main tool for recruiting. Much of this depends on the colleges themselves. It is difficult to deny that the GRE has advantages as a test metric that can make it easy to pick one student over another for admissions. This helps colleges appear to be fair in their admissions policy as they don't manage the test. While most of the questions seek to be valid across different cultures and backgrounds this is inherently impossible. A small spread of 5 or 10% could make it difficult for one group to get in over another. The reason why this occurs is because each culture assimilates and integrates an image of words. A cow to one culture might recall different features than another culture that has less exposure to cows. A cow could be one breed in one place and another breed somewhere else. A simple question on a cow might have different recalls and different understandings of what a cow is used for. This might be an extreme example but variations in symbols and images that make their way into definitions are different and lead to different understandings of the questions themselves. The GRE is still a valid tool but isn't the only tool. 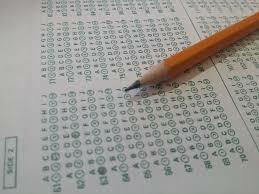 Other assessments can be used to determine a person's capacity to succeed in higher education. Success in college is more than grades alone but also the confidence and social abilities of the student. It takes the whole student to achieve not just a single facet of each student.